There is no better way to absorb the essence of a city than to visit its markets, and it doesn’t much matter if those are flea markets, ordinary fruit and vegetable markets or those meant to sell cheap trinkets to tourists. 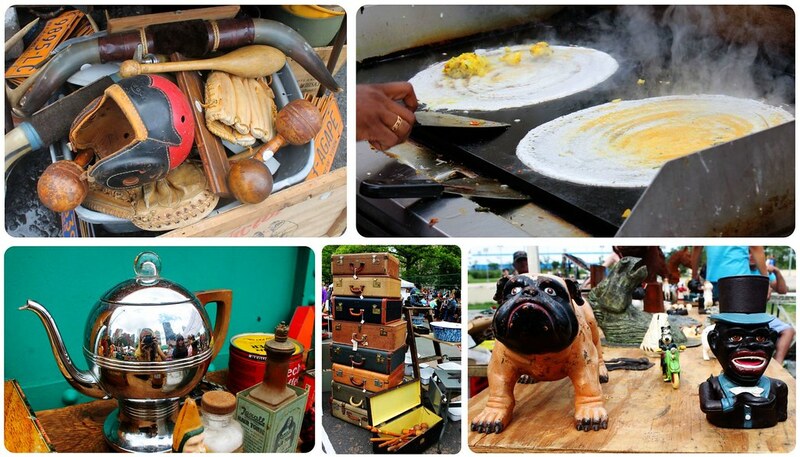 There is just something about strolling past the stalls, taking in the energy of buyers and sellers, the different languages, smells, foods, the local handicrafts, clothes, antiques and souvenirs. 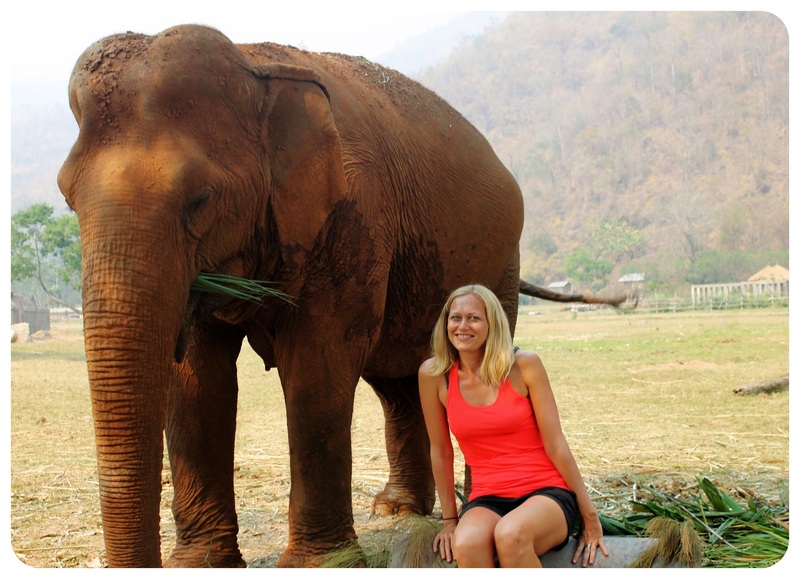 Some markets have a real sense of purpose while others just seem like fun cultural experiences. 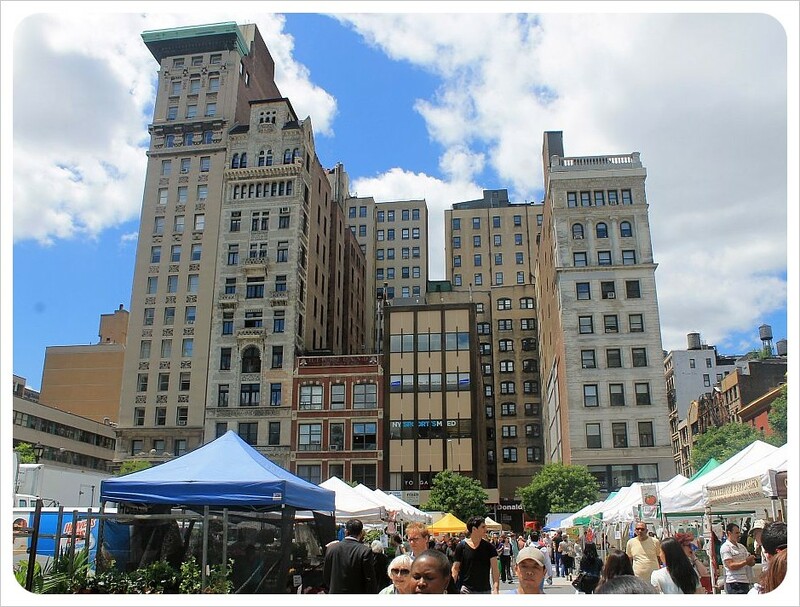 Set right on Union Square, this market has some of Broadway’s most historic buildings as its backdrop. The Greenmarket is a paradise for health-conscious eaters – with locally made yogurt and honey, grass fed beef, organic fruits and vegetables, artisan breads and vegan muffins. If you come in the afternoon before the market shuts down, you’ll be able to find some of the best deals. Obviously, the variety of produce is much bigger in the summer and fall months, but the market is open year-round. When the Greenmarket initiative started in 1976, there were only 12 farmers – today, there are over 230 farmers who belong to the Greenmarket network, the biggest farmers market network in the US which has 54 markets in New York City alone. Union Square Greenmarket even made CNN’s Top Ten Fresh Markets In The World. Brooklyn Flea takes place every Saturday in the Fort Green neighborhood of Brooklyn, and felt like the biggest flea market out of the many we visited in New York. We were beyond excited to pick up an authentic Masala Dosa from an Indian food stand (although at $10, the price was nearly 20 times an ‘authentic’ price! ).We wandered through the set-up of antiques and second-hand stalls selling everything from kitschy ceramic owls and in-your-face reminders of a segregated past to up-and-coming furniture dealers and trend-setting jewelry makers. 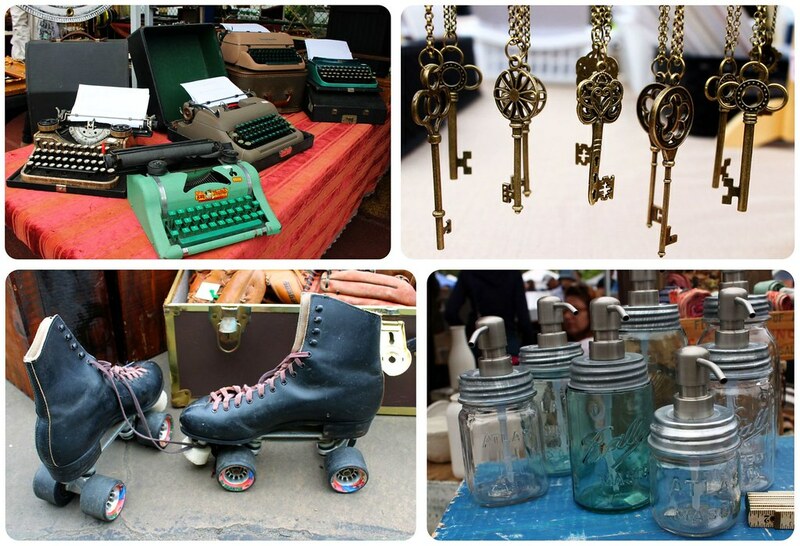 Just opposite the Brooklyn Masonic Temple, the Brooklyn Flea is one of the fastest growing flea markets since its inception in 2008, now attracting over 200 vendors every week. 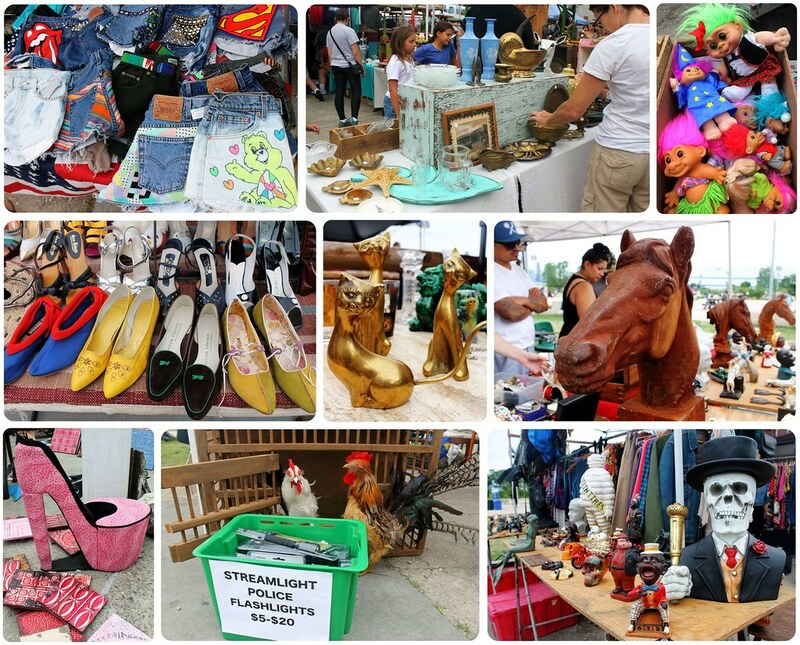 The Williamsburg Flea Market is an offshoot of the Brooklyn Flea, taking place on Sundays at the East River State Park in Williamsburg. Over 100 vendors offer antiques, vintage, furniture, unique Brooklyn-made clothes, distinct indie fashion, memorabilia and jewelry, plus over a dozen food stalls – many of the vendors are actually selling at the Saturday flea market in Fort Greene, so if you have only one day to visit the flea market – they’re both equally as good, but we love the set-up right by the East River with Manhattan’s skyline on the other side, and had a great time eating our delicious Salvadorian pupusas right by the water. 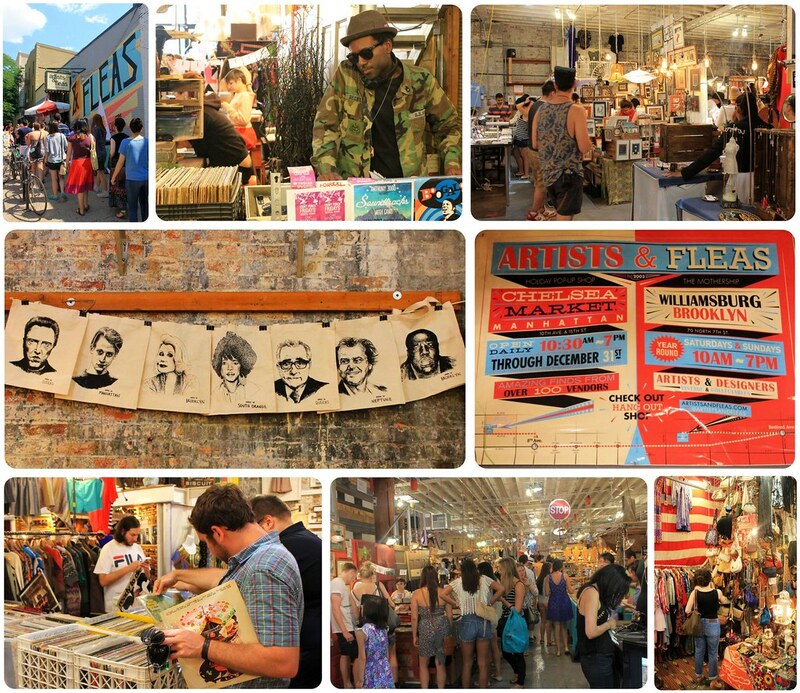 Of course this is also the place to come for some hipster spotting, as typical Williamsburg locals – designers, creators, vintage collectors and foodie enthusiasts – all see this Flea as an established and important fixture in the neighborhood. Just around the corner from the River State Park is the indoor Artists & Fleas market. When it opened in 2003, it did so in an old warehouse on what was a neglected part of North 6th Street, before Williamsburg’s popularity exploded shortly after. Open on Saturdays AND Sundays, this is the best place to come for everything from creative inspiration to furnishing your new apartment. Here you will find paintings and photography by local artists, antique books, jewelry handmade out of just about any material – and the same goes for furniture and other accessories. Details: Williamsburg Flea is open on Sundays from 10am to 5pm from April to November inside East River State Park at Kent Ave and N. 7th St in Williamsburg; closest subway stop: Bedford Avenue (L Train) or you can take the East River Ferry to North 6th Street. Tip: If you are visiting New York in the winter, there is a ‘Winter Flea’ in Brooklyn’s historic Skylight One Hanson building (formerly the Williamsburg Savings Bank in Fort Greene). 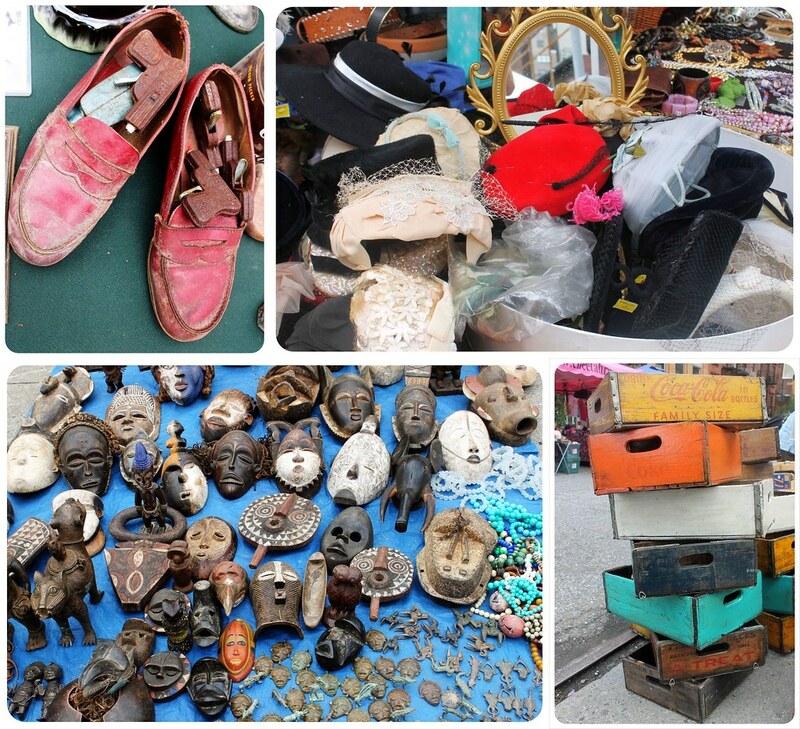 It is worth visiting this flea market for this famous Brooklyn landmark alone! More than 100 vendors sell here from late November to early April every Saturday and Sunday from 10am to 5pm. We made the rounds of the city’s markets, so several of the stalls at the Hell’s Kitchen Flea Market were familiar by the time we made it there. Held Saturdays on 39th Street in Hell’s Kitchen: Here’s why we love this one so much. The location is great and the market was relatively empty considering its Midtown Manhattan location, within walking distance to Times Square. This market is a paradise for collectors of antiques, vintage clothes, oddball memorabilia, retro items, jewelry, furniture and its rumored that many set designers and props masters come here to source decorations and furniture for Broadway and Off Broadway shows. The only thing that is missing is a line of food stalls, but since Hell’s Kitchen is a hub for great food, that didn’t really affect us much at all. 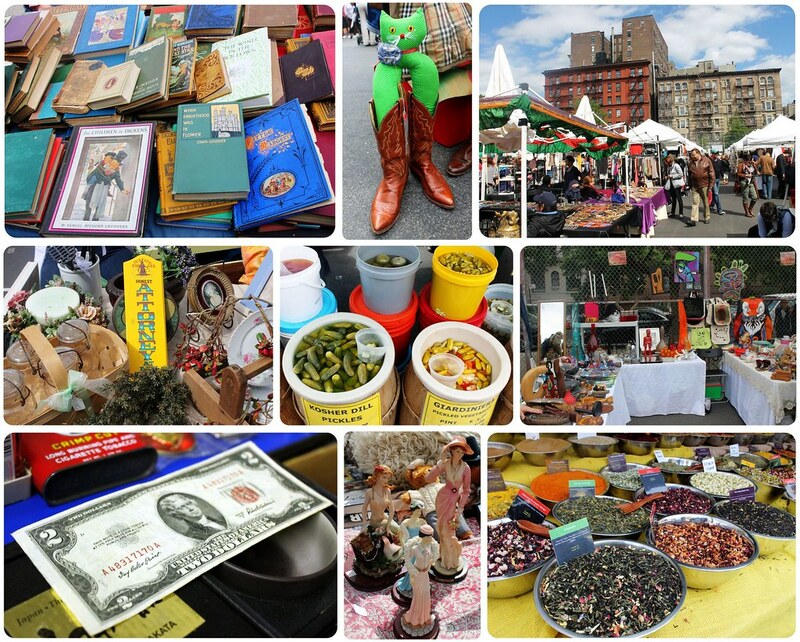 The Hell’s Kitchen Flea Market was actually named one of the Top Ten Shopping Streets in the World by National Geographic. Tip: The Hell’s Kitchen Flea Market also runs the Antiques Garage (every Saturday and Sunday from 9am to 5pm, 112 West 25th Street (between 6th and 7th Avenues) and the West 25th Street Market, also every Saturday and Sunday from 9am to 5pm, located on West 25th Street between Broadway and 6th Avenue. 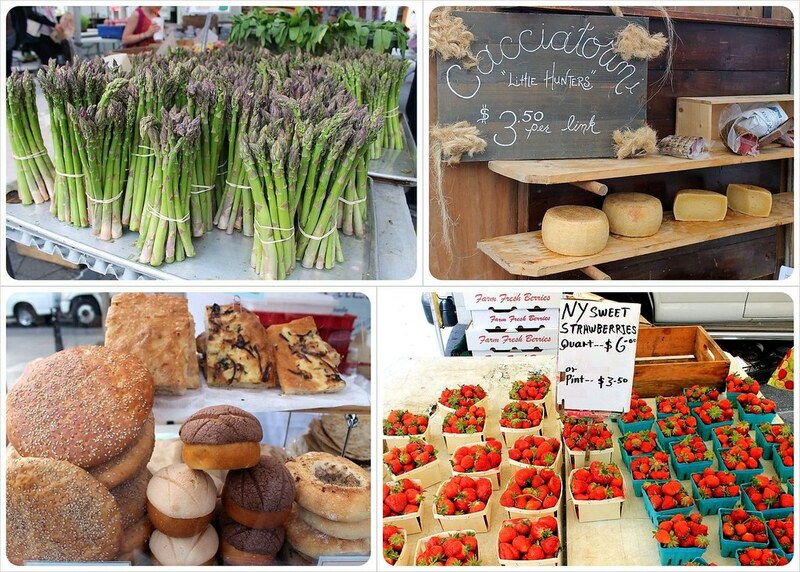 Our absolute favorite market is Smorgasburg, a food market right by the Brooklyn Bridge (on the Brooklyn side). 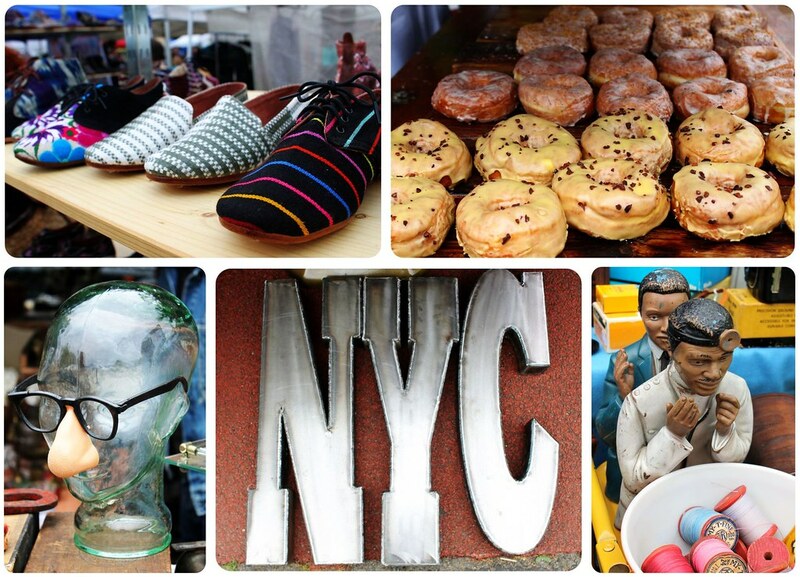 Like the Williamsburg Flea, Smorgasburg also belongs under the Brooklyn Flea umbrella. There are two – we much preferred the Brooklyn Bridge Park location on Sundays over Saturdays in Williamsburg. 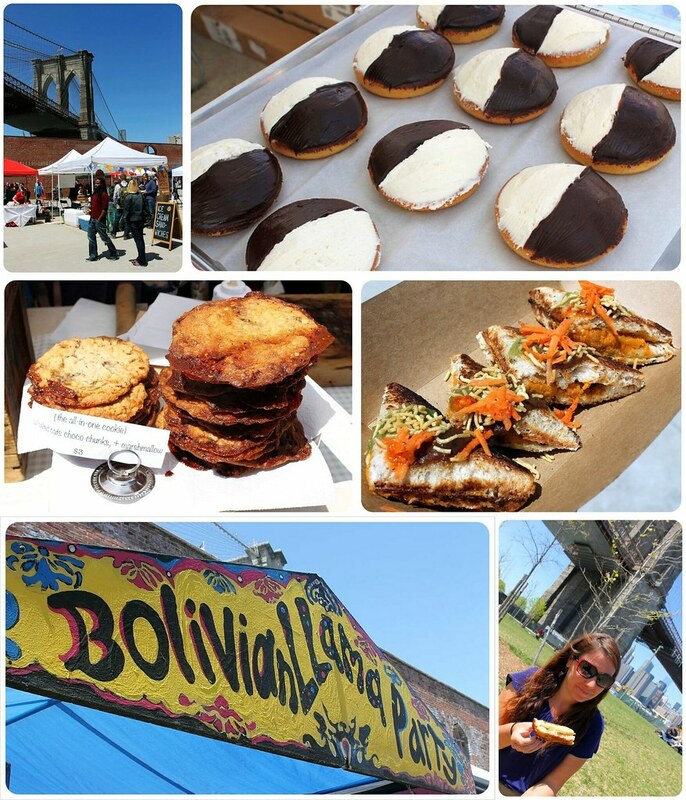 Here you can grab a fresh-made pizza, Bolivian empanadas, raw vegan food, ice cream, coffee, Vietnamese street food, Mexican tacos or anything you could possibly think up and then sit down right in Brooklyn Bridge Park looking right out at Manhattan and the Brooklyn Bridge. Foodies love New York institutions such as Keizo Shimamoto’s ramen burgers, Blue Bottle Coffee, Milk Truck’s grilled cheeses, Butter & Scotch’s pies, and Lone Empire’s smoked briskets, a favorite with meat eaters. Come early though, or you’ll face long lines and crowded tables. Top tip: Definitely come hungry! Details: Open on Sundays from 11am to 6pm (April through November). Location: Pier 5 in Brooklyn Bridge Park; closest subway stations: Borough Hall (2, 3, 4, 5 Trains), Court Street (N, R). You can also take the ferry to Brooklyn Bridge Park/DUMBO Pier 1 ferry stop from Wall St./Pier 11, North Brooklyn, or E. 34 Street. 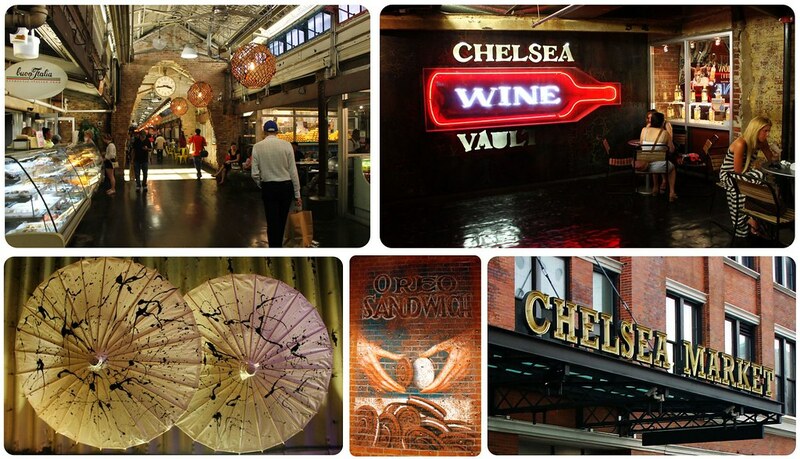 Not a market in the traditional sense, Chelsea Market is more of an upscale assembling of restaurants, bakeries and food stores housed in the former home of the National Biscuit Company, where the first ever Oreo was made in 1912. The industrial aspect of the building was maintained when it was transformed into a market, creating an industrial chic vibe. Eateries include the fabulous Green Table, Chelsea Thai, a small storefront of the Artists & Fleas market from Williamsburg, plus Amy’s Bread – which has excellent cupcakes and other sweets, The Fat Witch – some of the city’s best brownies and Eleni’s famous cookies. Just off the Highline Park, this is a great pit stop for snacks to eat up on former railroad line turned green space and park, all with great views over Lower Manhattan. Upstairs and out of reach for the everyday tourist are several television studios, including Food Network’s headquarters, where Iron Chef is filmed. Sure we already mentioned Smorgasburg, and we made clear that we prefer the ‘other’ one, but we love Smorgasburg so much that our second-favorite Smorgasburg is also our second favorite food market in New York. 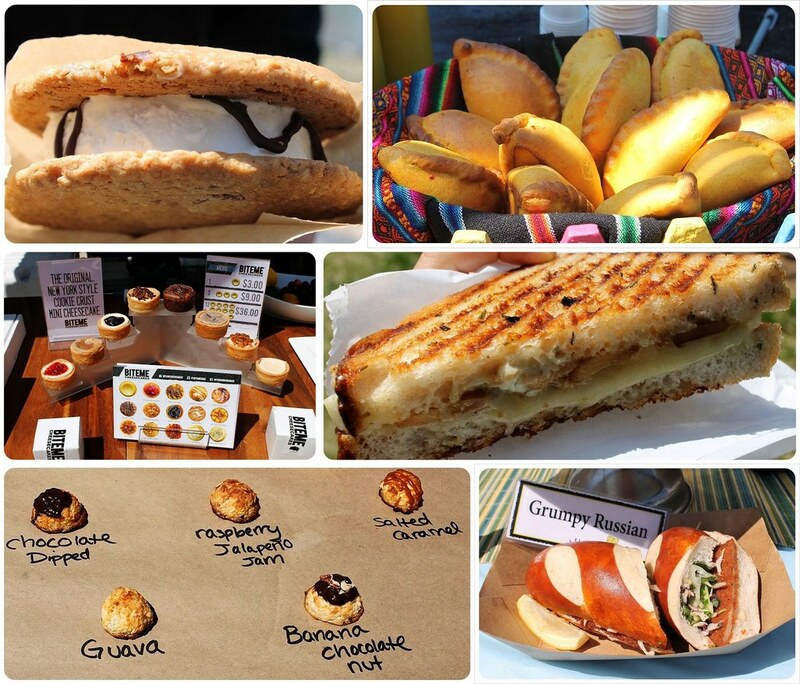 The vendors are similar to the ones in Dumbo, offering food from all over the world and classic American grub like burgers and grilled cheese. Many famous New York eateries sell here, like the Red Hook Lobster Pound, Blue Bottle Coffee, The Meat Hook, People’s Pops popsicles, McClure’s Pickles, and many more. Details: Every Saturday from 11am to 6pm (April to November), see #3 for directions. 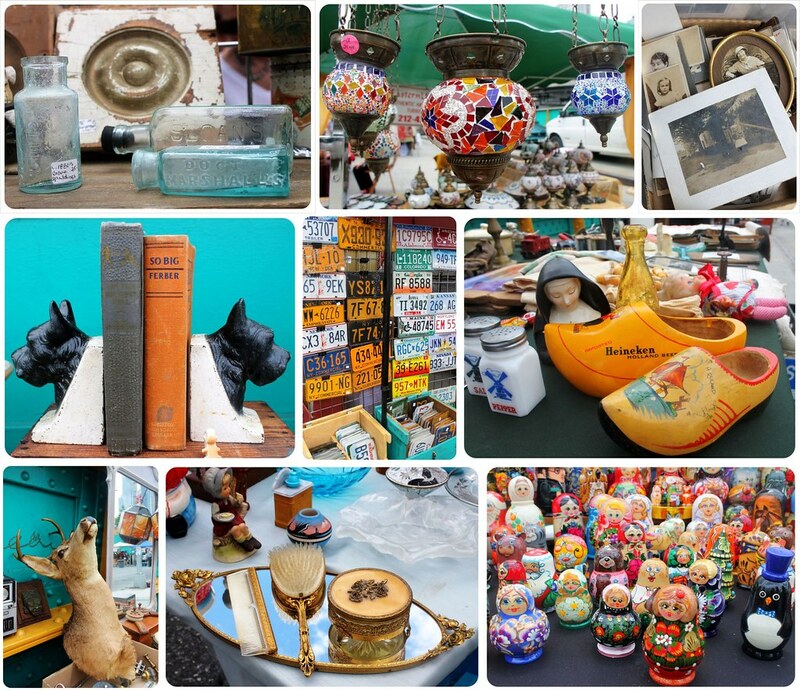 A great excuse to stroll through the Upper West Side, the Green Flea market on Sunday has dozens of vendors of antiques, collectibles, vintage clothes, jewelry, handicraft, food and more. Located right next to the Natural History Museum, the Hayden Planetarium and a short walk from Central Park, you can easily combine a morning here with an afternoon museum visit or stroll through the park. 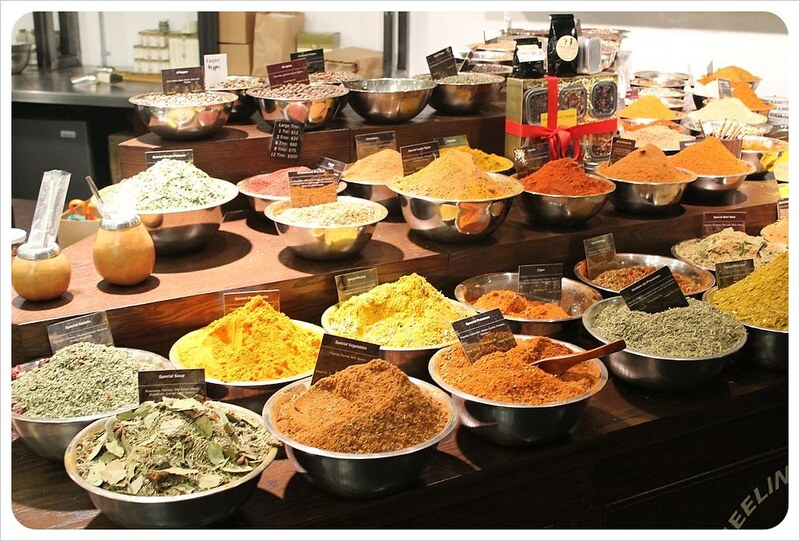 What is your favorite market in New York City? Love this – everything just short of the kitchen sink; food, stuff you need for your house, stuff for the house you don’t need, more food and… wine. Awesomesauce! I love this and it’s one of the reasons I could definitely live in NY. When I have a house again I want to fill it with flea market stuff! Keeping this list in mind for December! Smorgasburg market definitely looks like my kind of market. And no doubt, Zab would have a whale of a time rummaging through pretty but useless things at Williamsburg Flea market! If you ever head to NYC during the summer months, you’ll have to go to Smorgasburg 🙂 You’ll appreciate all the foods from around the world! 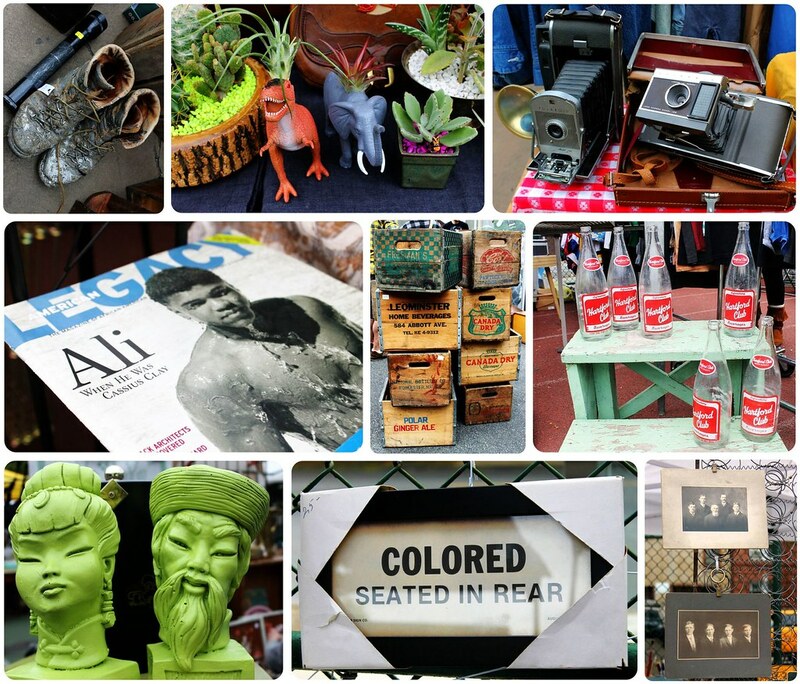 I went to the Brooklyn Flea market as well when I went to NY and I loved it. I have never seen so much quirky stuff for sale. Right? So many memorabilia… and people LOVE it! The ‘Colored seated in rear’ sign at the Brooklyn Flea was quite shocking. This makes me want to go back and explore New York even more! Great post. Love these markets! 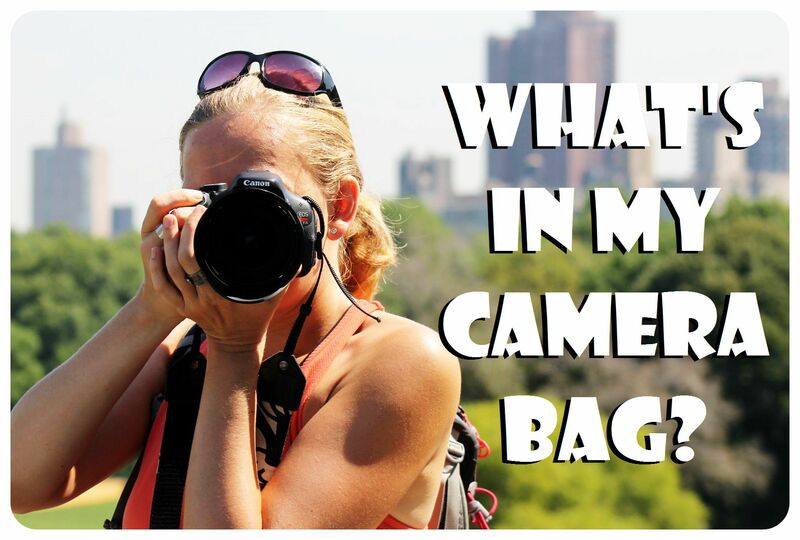 Great post this, I’ve been to Chelsea Market and Smorgasburg, but I definitely have to check out the other ones! 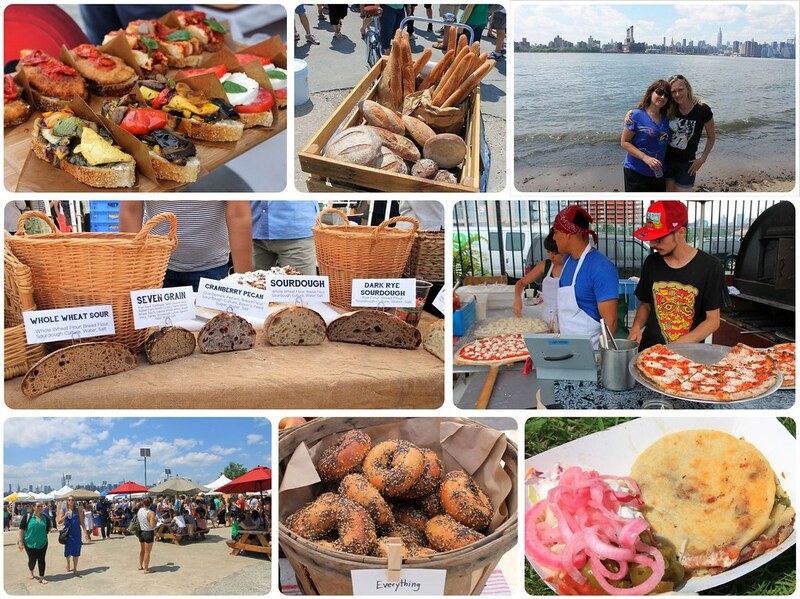 Smorgasburg is awesome and it’s getting more and more popular it seems. One that I would like to add, but I’m not sure if it fits your criteria of a market, is Eataly! Love that place and I just recently discovered it in NYC after coming back from Florence!